Should we apologize for Frank & Jesse James? The notoriety of the outlaw still commands public attention today. Conflicting allegations between families claiming to be descendents of the outlaw prompted the body buried under the Jesse James tombstone at Kearney to be exhumed this past July 19. The event attracted widespread publicity, even television crews from England. "I knew that the body would be exhumed long before the notion became public," Mr. Chilocote says. "I sat o?n the story for six weeks, something really hard for a retired newspaper reporter like myself since this undoubtedly would command national attention. But when word finally leaked out, it was no surprise to me that interest was so widespread." 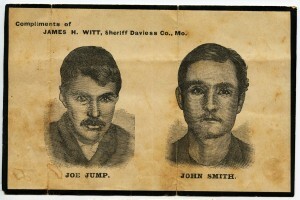 An autopsy o?n Jesse James was performed in 1882 after his shooting in St. Joseph. Chilcote believes the outlaw’s brain was probably removed during that official proceeding. Unfortunately, those records have been lost. That allowed speculation to simmer until accusations prompted this most recent effort to positively identify the remains. Grave diggers took three days to exhume the body. There were surprises. Chilcote said the coffin was made of wood and had collapsed to a height of about six inches. The body apparently was buried face down, but seemed anatomically correct. "Perhaps Jesse really had turned over in his grave over some of the things said about him over the years," Mr. Chilcote quips. Chilcote expects a determination to be announced Feb. 23, 1996. Studies are being performed by the American Academy of Forensic Sciences in Nashville, TN. The work involves DNA identification, tracing through the female line of the family. This is the same method which was used to identify remains of military veterans during the Vietnam war. 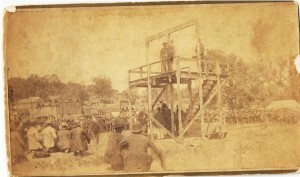 Mr. Chilcote was personally involved in the reburial ceremonies for Jesse James. He finds it odd to be a pall bearer for a man who died 113 years ago. This was James’ third burial; 20 years after his murder his mother, Zereld Samuel, moved to town and eventually, in 1902, Jesse was buried beside his wife in the cemetery at Kearney. The number of people who attended the funeral, the continuing controversy it stirs, and the interest in the forensic report yet to come all underscore Chilcote’s point that people?– especially cultural and historical tourists — are interested in anything authentic about the James Gang. "Gallatin is going in the right direction in renovating your county’s Squirrel Cage Jail," Chilcote says. "You’ve got so much James Gang history in this area to work with, but you need something for visitors to actually visit. Two years ago, for instance, I brought members of the national James-Younger group to visit here. They were excited about it although we could actually do little more than share an enjoyable meal here at McDonald Tea Room. Mr. Chilcote applauds the idea of reconstructing the Daviess County Savings Association builing robbed by the James brothers in 1869. He suggests that Courter Theater might be put to some use as a backdrop to focus o?n the 1883 Trial of Frank James which occurred in Gallatin, since the trial was actually held in an opera house here. "You need to get something together to display your James Gang history, even if nothing other than devoting a corner in a store somewhere to local history, legend and lore. A tourist is someone who travels more than 50 miles and spends a few bucks. That’s what tourism is all about, and it’s an economic tool just waiting to be fully used here." Mr. Chilcote speaks with some authority. He is o?ne of the founders of the Pony Express Museum in St. Joseph with over 33 years of volunteer service. He notes that museums don’t necessarily share in attracting tourism dollars. Admissions into the Patee House during 1995 were down by 7 percent, he said. But admissions into the Jesse James home nearby was up by 11 percent. Northfield’s proximity to the Malls of America. But regardless of the scope, it does prove that people continue to be genuinely interested."